And now that you’re here, be brave. Be everyway alive. The last lines of Peter Gizzi’s poem that, for Sally Kemp, inspire thought and action. 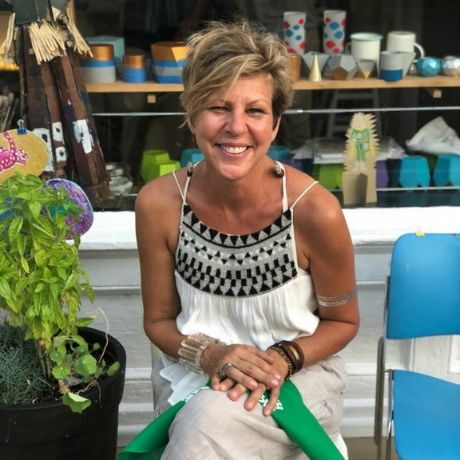 As founder of Milk River Arts, Sally uses courage and creativity to inspire a neurodiverse community of artists who make up a collective in the Church Hill neighborhood in Richmond, VA. Her purpose is simple - Recognize and value the artists who live among us and introduce them to the right mentors & materials so they can support one another and amplify what is their One-of-a-Kind Voice. Sally curates the exchange between artists with and without disabilities and feels the hum of being most fully alive in moments where validation, delight and discovery spring up inside the studio. She believes in looking for things in the world that feed her own spirit as well as the spirit of others. She encourages you to listen deeply and allow yourself the thrill of stepping into something uncomfortable — she’s finally figured out that life can be more than we ever dreamed it could be when we are open to being unsure how it will turn out. She is most proud of family— both created and chosen- her daughter Zoe, a fierce force of love and strength & her trueblue friends who have helped create a HOME at each of the 9 addresses she has lived in the past 7 years. Ask her about that one time she reinvented her life and became both Head of Housekeeping and Aspiring Barrel Racer on a Wyoming dude ranch. Helping to build strong and healthy communities benefits us all. We apply the same principles of innovation, collaboration and empowerment to our work in the community that we do in our business. Just as we did when our company was founded in 1970, we continue to call ourselves “printers” – and so do our customers. Makes sense. Offset, digital, wide-format, and letterpress printing are today the core technologies of Worth Higgins & Associates. UV ink and coating, foil stamping, embossing and die cutting are tools of the printing process that we handle extraordinarily well in helping our clients achieve their creative goals and take their ideas beyond their imaginations. Here’s what you need to know about us. We break traditions. We break molds. We break through. Our passion is to help you make the change you need to succeed. From strategy to execution, we create the kind of change that brings you closer to the people you serve: citizens, consumers, and entire communities. Joe Smith is the brand and creative consultancy of Padilla, which dives deep into business challenges – beyond symptoms to the very root of what needs solving. We become a member of your team and an advocate for your customers, uncovering that sweet spot where your needs and theirs intersect. Then we help you craft the strategies, stories and innovations that grow your brand. Consider cultural impact as The Martin Agency’s modus operandi. When Jimmy Kimmel, Ellen DeGeneres and Stephen Colbert spontaneously start talking about our clients…when our clients are a Jeopardy! clue and Wheel of Fortune reveal…when SNL parodies our man in a lady wig…we consider it both a good day and all in a day’s work. And maybe a Hump Day, too. A full-service advertising agency with a goal of not just making our clients seen – but making them culturally relevant, Martin has created steady buzz around GEICO, OREO, UPS, Donate Life and Walmart, to name a few. And we’ve been doing it as far back as 1969 when we penned Virginia is for Lovers. People still wonder, What can Brown do for you? Work that leverages culture, wakes people up, fights invisibility, and gets talked about – it’s what we do, and we’ve done it for 53 years. IdeaWeavers Helps Businesses Become More Effective. We started IdeaWeavers to solve the expense and long implementation times associated with most enterprise-class systems. We are focused on quickly understanding your needs and delivering a system for you. CreativeMornings/Richmond gives our city’s most amazing people a space to gather each month to get inspired, support each other, forge relationships and collaborate. Whether you are a maker, mover and shaker, or just need a little inspirational boost - this is a place for you because we are firm believers that #RichmondIsCreative. Thanks to the support of our beautiful venues and partners, our events are free of charge - you just have to register ahead of time to reserve your spot.